The Brexit vote and the election of Donald Trump will forever be linked in history. The two events took place within a few months of each other. Both were populist revolts that appealed to similar constituencies. After Mr Trump’s election, Theresa May, Britain’s prime minister, was the first foreign leader to visit the new US president. A photograph of the two leaders walking hand in hand quickly became a symbol of the closeness of Trump’s America and Brexit Britain. For mainstream politicians in Europe, “Trump and Brexit” became shorthand for the forces that they were trying to combat. But, as the months have passed, it has become clear that Trump and Brexit are not, in fact, identical twins. They are more like distant relations who are growing further apart with the passage of time. The differences between the Trump phenomenon and Brexit are a matter of both style and substance. Mr Trump violates the conventional expectations of how a US president should behave on a daily basis. Mrs May, by contrast, is scrupulously correct in her behaviour. She is about as likely to attend an EU summit in her pyjamas as to tweet that she is a “very stable genius”. Early in her period in office Mrs May suggested hopefully that she might get on with Mr Trump because “opposites attract”. But that pretence has now been dropped. When the president retweeted posts from a British far-right group, Mrs May was forced to condemn him. Predictably Mr Trump lashed back, although he initially directed his ire at the wrong Theresa May, lambasting a British housewife with just six Twitter followers. The slapstick comedy of this incident obscured a serious political difference. In office, Mr Trump has embraced anti-Muslim rhetoric that Mrs May has carefully avoided. That difference is part of a broader divide between the radical nationalism of Mr Trump and the cautious and conventional globalism of Mrs May. For although many Europeans and Remainers are convinced that Brexit is a nationalist spasm, and little else, the May government is determined to present it in a different light. The prime minister’s argument is that leaving the EU is an opportunity to forge a new future as “Global Britain”. She has emphasised her support for the international, rules-based, liberal order. By contrast, Mr Trump remains a proud, “America First” nationalist who is deeply suspicious of all international institutions, from the UN to the World Trade Organization. These very different international visions have led to policy disputes between Brexit Britain and Trump’s America. Neither side has much interest in playing up these differences. But on a succession of issues, Britain has sided with the EU rather than the US. When the Trump administration repudiated the Paris climate accord, the UK stuck with the agreement and the European consensus. The same pattern repeated itself when the White House announced its intention to move the US embassy in Israel to Jerusalem. And while Mr Trump is itching to rip up the Iran nuclear deal, Britain has joined the rest of the EU in supporting it. Perhaps the most consequential policy division is over the WTO. The Trump administration is quietly hobbling the world trade body by blocking appointments to its court. But a functioning WTO is critical to Mrs May’s plans to make Brexit work. The UK has stressed that, if it cannot strike a new trade deal with the EU, it will fall back on WTO rules. Mr Trump’s agenda could wreck the body that Britain is relying upon as its insurance policy. Some of the ideologues behind Brexit remain wedded to the idea that Britain is part of an “Anglosphere” of English-speaking nations, with the US and the UK at its heart. But Britain’s foreign policy choices since the Brexit vote suggest that the UK is actually more comfortable with the Franco-German worldview than the American one. The repeated low-key clashes between the May government and the Trump administration emphasise the extent to which Britain is now “in play” as a foreign policy actor. If the Brexit negotiations come to a reasonably amicable conclusion and Mr Trump remains in the White House, post-Brexit Britain could easily end up closer to the EU than the US. The more ardent Brexiters would argue that this is simply because the British establishment has failed to understand the populist moment. But opinion polls suggest that Mrs May’s policy decisions reflect wider sentiment in Britain. A Globescan survey last year showed that only 33 per cent of Britons believe that the US has a “mainly positive” impact on world affairs; compared with 84 per cent positive ratings for Germany and 66 per cent for France. Some 79 per cent of Brits trusted President Barack Obama’s judgment, compared with 22 per cent who trust President Trump. These numbers underline the differences between Brexit Britain and Trump’s America. British political debate since the Brexit vote has been bitter, but it has been conducted in largely conventional terms. By contrast, Mr Trump’s White House increasingly feels like a deranged episode from a reality TV show. The vote for Brexit and the election of Mr Trump may have sprung from similar instincts. But they have ended up in very different places. The author of ‘Unstable Majorities’ argues that if the electorate seems fickle, it’s because the politicians are too ideological. Most observers of American politics predict 2018 will favor the Democrats. The party has a good chance of taking control of the House in November, and even a Senate majority is within reach, although Democrats are defending three times as many seats in the upper chamber as Republicans are. Here’s a safer prediction: If the Democrats do triumph on Nov. 6, they and their supporters will emerge triumphalist, proclaiming their majority permanent and President Trump a lame duck. Ten months in advance, Morris P. “Mo” Fiorina has a bucket of cold water to throw on such claims. Did we ever. The party controlling the House, Senate or White House changed in seven of the nine elections between 2000 and 2016—the only exceptions being the presidential re-election years, 2004 and 2012. “I sort of trace it back to ’92, the end of the Republican presidential era, and then ’94 is the end of the Democratic congressional era,” Mr. Fiorina says. Those were long eras. Republicans held the White House for 20 of the 24 years following the 1968 election. The Democrats dominated Congress for the better part of a lifetime: During the 62-year period after the 1932 election, the party had a majority in the House for 58 years and the Senate for 52 years. The Democrats took the House in 1954 and held it for 40 years straight. Those old enough to remember the decades before the ’90s, then, may tend to see permanent majorities around the corner because they expect a return to normalcy. Mr. Fiorina, by contrast, argues that frequent shifts in political control are now the norm because of the way the parties have changed. He rejects the common view that American voters are “polarized.” Instead, he says, the parties have become polarized, in a process he calls the “sorting” of the electorate. A line graph illustrates the electorate’s continuity. The share of Americans identifying as politically moderate has remained fairly constant—around 40%, and usually a plurality—since at least 1974. In the same period, another chart shows, independents overtook Democrats as the biggest partisan grouping. As the parties drifted from the ideological middle, centrist voters disaffiliated from the parties. That creates what Mr. Fiorina calls “the ping pong pattern” of unstable majorities. One party manages “to win, narrowly, and then they immediately respond to their base. So Bush says we’re going to have personal Social Security accounts, and voters—some say, ‘I didn’t vote for that.’ Or Obama says we’re going to do government health care, and a lot of them say, ‘I didn’t vote for that.’ ” Lawmakers from the party in power “suffer for it in the next election, when they lose the marginal voters,” as Republicans did in 2006 and Democrats in 2010. That seems plausible enough, but there’s an obvious complication: Most legislation that makes it through Congress, even on a party-line vote, is not all that extreme ideologically. Take health care. Mr. Fiorina pulls up a chart titled “Issue Centrists Still Dominate,” based on data from the American National Election Studies. It shows that in five issue areas, the centrist position is by far the most popular. But isn’t that what they got with ObamaCare? The Affordable Care Act shifted policy leftward, but nowhere near the extreme of single payer. 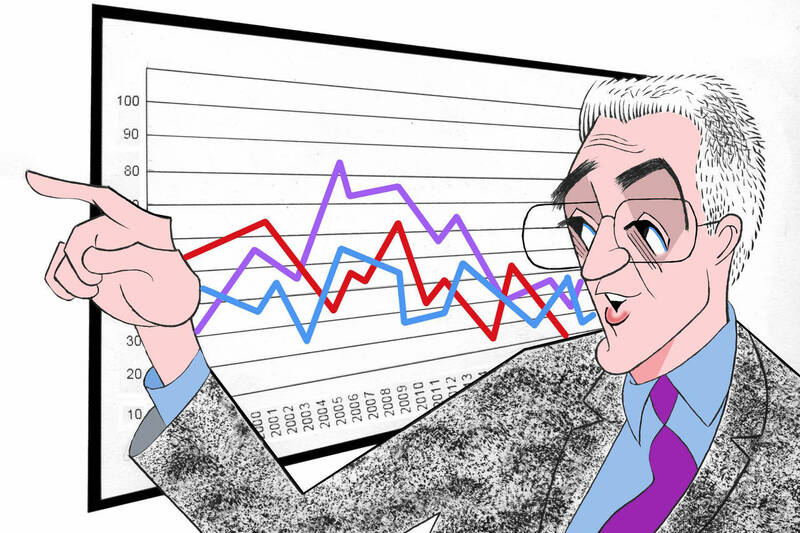 Its central element, the recently repealed individual mandate, was first proposed by the Heritage Foundation in 1989 as a “market-based” alternative to more-statist approaches, including outright socialization. That doesn’t mean all incumbents are vulnerable. A Democratic lawmaker in a heavily Democratic district, for example, will almost certainly win. The diminution of the incumbent advantage simply means that, all else being equal, a Democrat in an open-seat race would likely win by almost as wide a margin as an incumbent. In the 1980s, Mr. Fiorina says, incumbency per se was good for 10 to 12 points on average. Nowadays, “how your president is doing” matters much more. In 2017 there were special elections for five House seats vacated by Republicans—in Kansas, Montana, Georgia, South Carolina and Utah. The GOP held all five, but all its candidates underperformed the previous incumbents’ 2016 margins of victory, by between 5 and 25 points. If Mr. Fiorina is right about the diminution of the incumbent advantage, these results would seem to bode ill in November for Republicans—incumbent or not—in marginal districts. On the other hand, if the Republicans do get wiped out this year, there’s a good chance they’ll stage a comeback in 2020. Or 2022 at the latest. Mr. Taranto is the Journal’s editorial features editor. By now you know that my swing trading approach is to focus on the 5-6 Month Intermediate Cycle Low (ICL) to establish positions. It seem’s that everything that I track has the 5-6 month low to low cycle. Sometimes the ICLs come sooner at 4 months or later at 7+ months but the average is 5-6 months. Everything also has a Yearly Cycle Low (YCL) which is nothing more than two 5-6 mont ICLs. Cycles longer than one year, however, vary by asset. The USD and Bonds have a 3 Year Cycle low to low and Stocks have a 7 Year Cycle low to low. Gold’s longer Cycles include a 4 Year Cycle and an 8 Year Cycle, which is simply two 4 Year Cycles back to back. Remember that longer cycles typically dominate shorter ones, meaning that if the longer cycle is in a bullish phase, most of its 5-6 month Intermediate Cycles will be right translated in terms of Time while making a higher high and a higher low (i.e. stair stepping up so to speak). 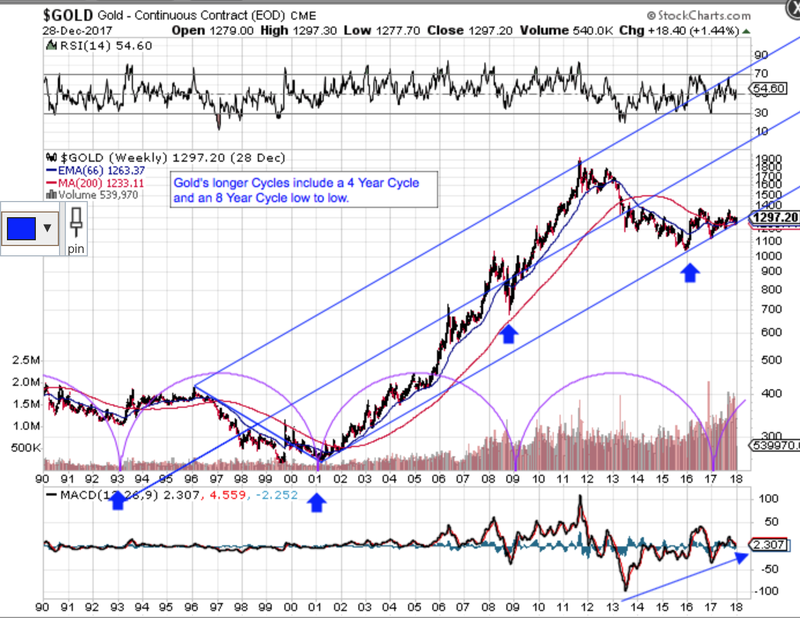 My first chart is a 28 year Gold weekly that shows Gold’s 8 Year Cycle pattern using the Purple Cycle tool on StockCharts. Cycles, however, are not exact, in terms of Time so I have added my Blue Arrows showing you that I believe Gold’s last 8 Year Cycle low came in early 2016 closer to the 7 year mark. The chart also shows a Blue Fork, that while not technically correct (handle does not attach), it does show you the long term Price channel I am tracking out of the 2001 low. Why is this important? 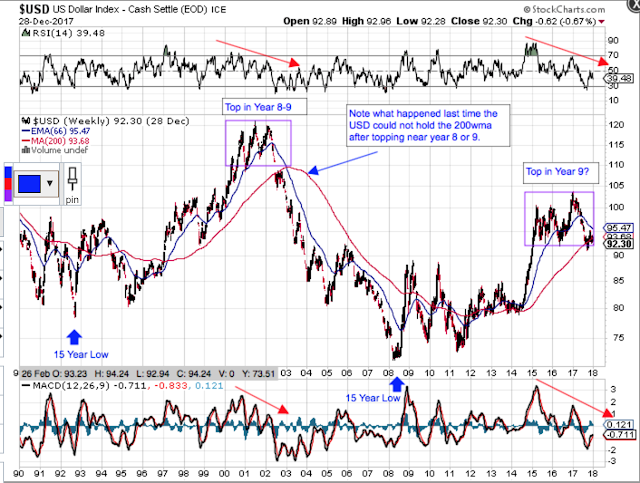 If Gold’s 8 year low to low pattern holds, the next one should be in the 2024 time frame. I also believe the USD’s longer 15 year Super Cycle has topped in Year 9 in early 2017. If correct, we should see downside price action in the USD for another 5 years, give or take a year. While the inverse correlation for the USD and Gold does not always hold, my expectations are that it will for much of the next 4-5 years as the USD moves into its longer term 15 year low. If correct, my expectations are that Gold will easily take out its previous high from 2011. WASHINGTON, DC – The just-released book about Donald Trump and his dysfunctional presidency (Fire and Fury: Inside the Trump White House) has left much of Washington reeling. Despite the White House’s constitutionally dubious threat to try to quash the book, the publication date was moved up four days. But the bulk of Fire and Fury’s disclosures, though deeply disquieting, aren’t all that surprising. It’s not yet clear how Michael Wolff, the book’s controversial author, obtained some of his information, but it must be assumed that he taped many of his interviews, particularly those used for the long conversations found throughout the book. What Wolff has achieved is to get attributed quotes from high officials about how the president functions, or doesn’t. But the book mostly tells us what most of political-journalistic Washington already knew: that Trump is unqualified to be president and that his White House is a high-risk area of inexperienced aides. The only surprise is that more calamities haven’t occurred – at least not yet. 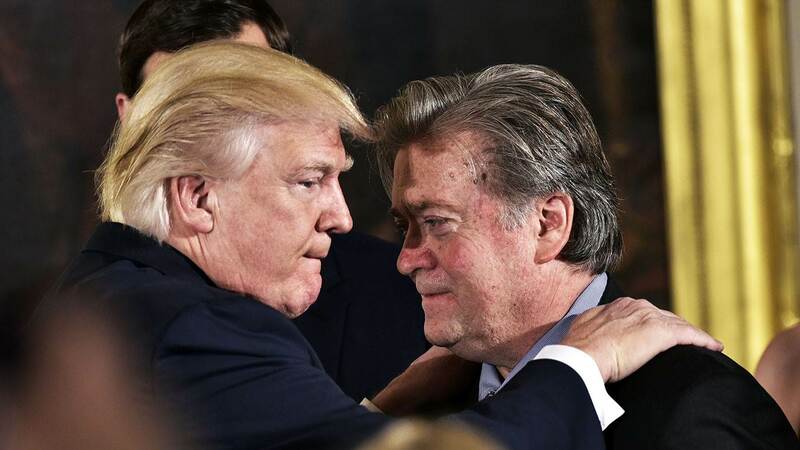 A good portion of what was released before the book’s publication concerns a battle between two of the most talkative, argumentative, self-regarding braggarts US politics has ever seen: Trump and his one-time chief strategist, Stephen Bannon. In the summer of 2016, with his campaign lacking a leader, Trump made Bannon – a scruffy, scrappy former businessman who was then the executive chair of Breitbart News, a website preaching white nationalism – the campaign’s chief executive. Bannon was full of big ideas about what a right-wing “populist” campaign would look like. The problem for Trump is that the citizens he was wooing have never added up to a near-majority of voters. His famous “base” is well under 40% of the public. But Trump and Bannon apparently preferred not to think about that. Trump is prone to taking out his frustrations on others – he is never to blame for his failures – and inevitably these landed on Bannon, who bragged more than was good for him about his power in the White House and asserted more than he should have. Bannon was ousted from the administration and left in August. Though he and Trump stayed in touch, in retrospect, an eventual falling out seems to have been inevitable. Trump and Bannon were like two overweight men trying to share a single sleeping bag. Their political world wasn’t big enough for both. They disagreed bitterly over whom to back in the race to fill a Senate seat from Alabama; but, at Bannon’s urging, Trump ultimately backed the erratic former state Supreme Court judge Roy Moore, who’d been removed from the bench twice, and who lost the race. Bannon was seeking to shake up the Republican “establishment” by backing similar “outsider” candidates in this year’s midterm elections, which, if successful, could make it all the harder for Trump to obtain victories in Congress. Despite his denials, it was Trump who more or less agreed to allow Wolff, whose reputation for slashing his subjects Trump presumably would have known from his years in New York City, to interview the White House staff for a book. Some aides say they believed they were talking to Wolff “off the record,” meaning that they wouldn’t be publicly associated with their remarks. But, even if that were true, it was hardly soothing to a furious president: they had said these things. Trump was also reportedly furious that Bannon had described the president’s favorite child, Ivanka, as “dumb as a brick.” Wolff also reports that Ivanka and her husband, White House senior adviser Jared Kushner, had agreed that after their expected smashing success at the White House, it would be Ivanka who would run for president. Overstating matters, as is his wont, Trump claimed, in effect, that Bannon had had nothing to do with his election victory, and that the two had almost never talked one on one. And, as is his wont, Trump threatened to sue Bannon. Trump has a long track record of threatening lawsuits without ever filing them, but even the threat can be costly to the putative target. Yet the momentary obsession with the feuding within the Trump camp shouldn’t obscure other realities. Behind the drama, Trump has certain clear goals, and cabinet and agency heads who share them – and who don’t get distracted by the publication of a juicy account of the president’s behavior. While much of Washington and its press corps were discussing the latest revelations, the Department of Justice, which is supposed to be somewhat independent of the White House, was being turned into a partisan instrument for pursuing the president’s grudges. Indeed, last week, it was disclosed that the DoJ was reopening an investigation into the already thoroughly investigated matter of Hillary Clinton’s emails. The FBI, it was also disclosed, would be looking into the Clinton Foundation. The use of a government agency to punish a president’s previous opponent recalls the behavior for which Richard Nixon was impeached, and suggests a very different form of government than a democratic one. Elizabeth Drew is a contributing editor to The New Republic and the author, most recently, of Washington Journal: Reporting Watergate and Richard Nixon's Downfall.